why each was significant in their lives. why was each item worth saving in a special box? ‘we all belong to an ancient identity. A fascinating puzzle to piece together. Fascinating. My gang will need a suitcase to hold all the bits I’ve kept over the years. i gotta re-locate my t-shirt with “Hey, Boo” emblazoned across the front. this blog entry just reminded me to figure out where I put it == somewhere amidst all the little boxes and shelves and drawers of treasures that only I love and understand! This blog today hits me where I live! It would be intriguing to put a story together. 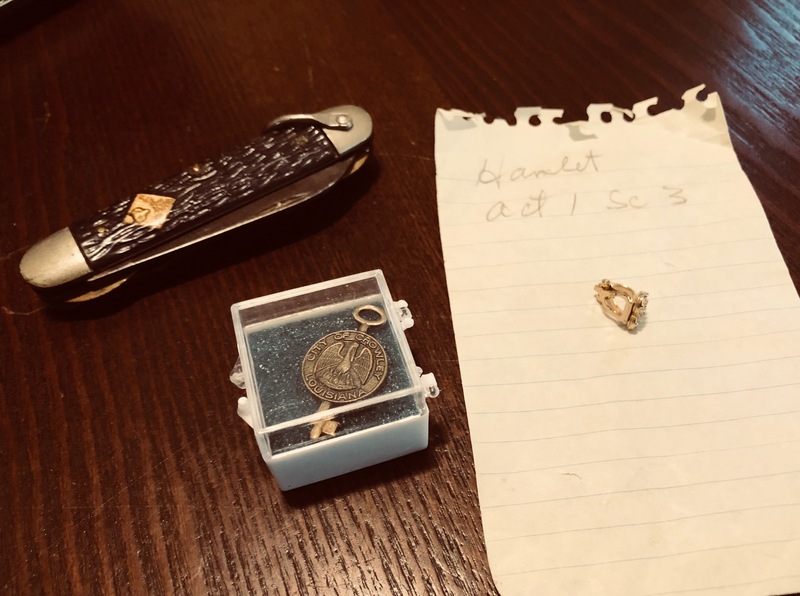 Sort of: the knife from his childhood boy scout days to the ear ring left after his first time, the key to the city where they fell in love…..
And I love the To Kill a Mockingbird references in the above comments–yes! I am so very intrigued. This sounds like a great leaping point for somebody in the family to write a novel, Beth. Would love to know the story! Thanks for sharing this, Beth. I had already separated personal items into envelopes for my girls when I’m gone but never really thought to explain what meaning the things have for me. I will definitely do that so they are not left wondering. Great post! what a fun mystery and keepsake! This moved me so deeply. We have so much of our ancestral energy without knowing any of their life stories. I would want to look piercingly through the items in the special box as if to make their story come alive. Fun post. Now I want to know also. Hey, maybe that key will come in handy some day. How very interesting. If you only knew. Reminds me that I intend to create some notes about items that are especially meaningful to me. They may or may not mean anything to those who inherit, but it feels important to do so. I love this quote and the story you shared. Definitely a story of rivers in each of these treasures. it’s a powerful one, isn’t it? What a great story could be created from these items! Oh she’s a lucky girl to be given such treasure 🙂 Your post reminds me of one I did a few years ago, about the archaeology of me. It’s interesting to think about what will remain of our lives in the future. Sometimes certain items mean a lot to us and they can’t be explained. They hold emotions and sacrifices and unwritten feelings.